Forgive me for neglecting “ye olde blog,” but I have been a busy girl. I’ve also been suffering from a bout of “well, does anyone really care about my shenanigans?” bouts of self-doubt. But, several of you have asked me about the blog and why I have not been posting. So I’m back with new stories and a new philosophy: I will post stories about the creative projects I engage in, whether they are successful or not. I will share stories about my friends and their creative efforts, hoping to build a community around the idea that artists are ordinary people, working to fulfill their dreams. We all share the same fears, doubts, and misgivings. But, in our willingness to try, we give permission to other ordinary people to try to fulfill their dreams too. This post is a great example of this philosophy. In earlier posts I talked about the impact that my high school drama teacher, James A. Nakamoto had on me and other members of his famed, “McKinley Theatre Group.” After we finished our “Celebration for Mr. Nak” many alumni were saddened to hear that there was no longer a drama program on campus. Matt Kim, a teacher at the school said he’d like to help mount a show so the kids who had been part of “Celebration for Mr. Nak” could have the chance to be involved in another stage production. 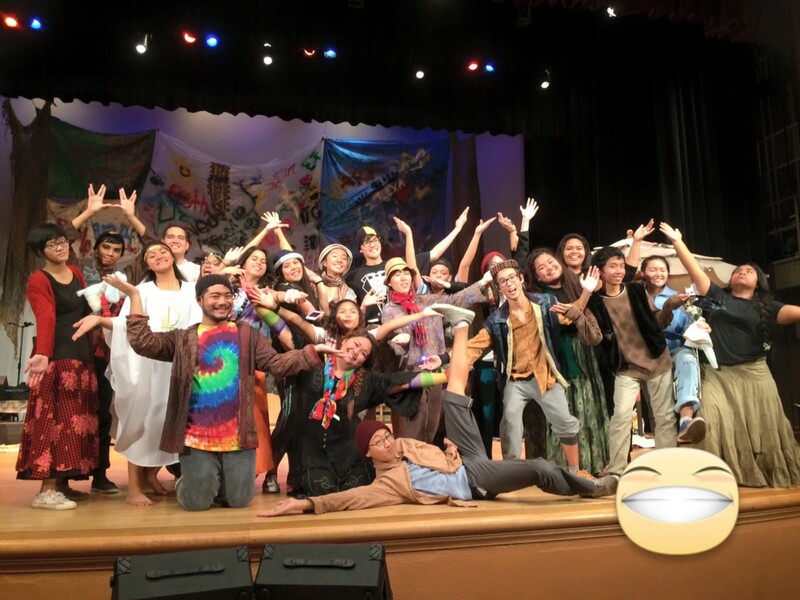 The show that was chosen was “Godspell JR.” Helen Chang, the speech club coach signed on as Assistant Director. In the spirit of “Hey kids, let’s put on a show” the alumni got together to coordinate the various aspects of production: finding the creative crew including a director, a choreographer, and a production manager. Along with the biggest challenge: finding the money to pay for the production. And wouldn’t you know it, but all the right people showed up at just the right time. Ordinary people with extraordinary skill sets came out of the woodwork to help. 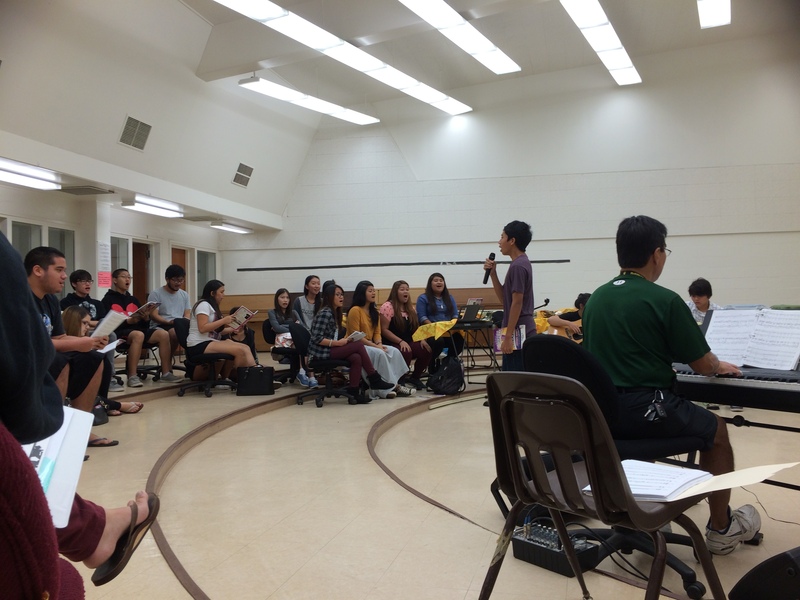 Auditions were held, and 35 students showed up to fill ten parts. It was decided to expand the roles, and we have a cast of 23 students. Luckily, one of the school’s Music teachers, Scott Taketa, volunteered to be the Musical Director. He wrangled his student band to play the music live on stage. The choir teacher, Natasha Takeda, volunteered to be the Vocal Director, leading the kids through their paces, learning the songs, teaching them their parts, and harmonies. And that’s how the process began. From the MTG Alumni, we had a working committee, William (Will) Ha’o signed on as Director, and I signed on as Production Manager. The last time I’d worked with Will was my senior year of high school. Mr. Nakamoto staged an ambitious production of “Jesus Christ Superstar,” and he asked Will to come back and play the part of Judas. Back in those days, I suffered from terrible stage fright (yeah, hard to believe) so I helped out working the light board. All the girls in the cast, me included, had crushes on Will because he was so darned handsome. 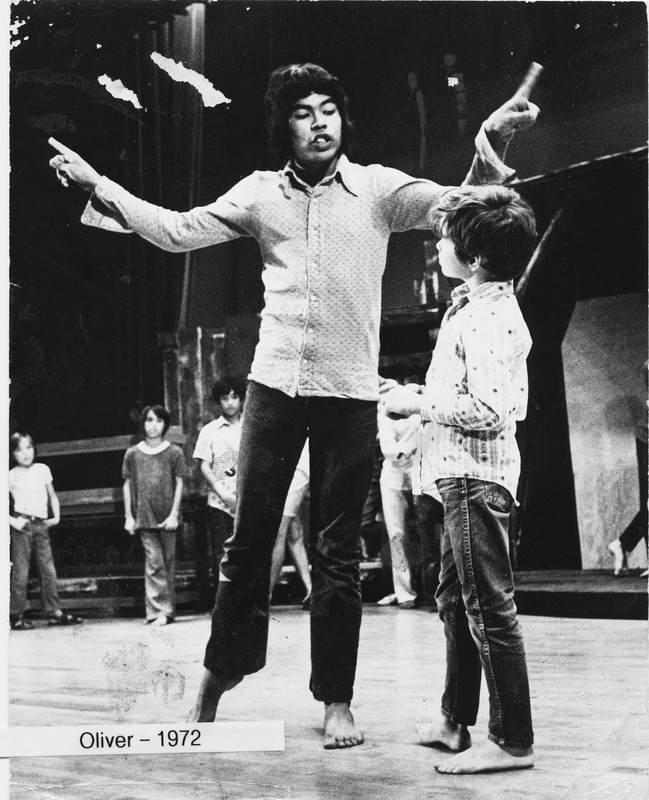 “Godspell JR” Director William Ha’o back in the day. During the many months of rehearsals ,we had our ups and downs. In every group effort there will always be personality clashes, it’s a given. But through it all our cast got better and better. They kept impressing us with their energy, focus, and devotion to putting on a great show. Behind the scenes, we discovered that we had no set designer, no lighting designer, and no money to pay them. We had no budget for set materials, and opening night was looming large. But Will and I knew our goal was to support our cast, and we were willing to do what it took to mount the show. Things had been going badly, but then I walked into the bad room the day the cast first rehearsed with the band. When the band started playing “Day by Day,” and the kids started singing, it was magical. It brought tears to my eyes as I listened to them. I looked over at Will, and he was tearry-eyed too. And it was in that moment that I understood why Jim Nakamoto was so devoted to the theatre group. It was thrilling seeing these kids come together and create something beautiful. After that everything began to fall into place. We’d lost our original choreographer, and our costumer said, “My husband might be able to help.” He came by, said he might be able to set up one or two songs. He worked with the kids and had so much fun, he ended up choreographing the entire show! I heard through social media that a friend of ours, Karen Archibald, a professional set builder, was coming to town, and needed a place to stay. I got in touch with her and said, “Want to trade some set construction time for a place to stay?” She agreed. We put out the call to the MTG alumni to bring down materials to build the set, and they showed up. Will’s idea was to set our “Godspell JR” cast in an urban, homeless camp. That gave us lots of options for decorating the set. A few months ago we had a big wind storm where I live. The wind picked up one of our back yard umbrellas and tossed it across the yard, breaking several arms. But, I took one look at it and knew we could use it in the set. The largest piece we needed to build was the fence where Jesus meets his end. We had an idea of what we wanted but no carpenter to build it. 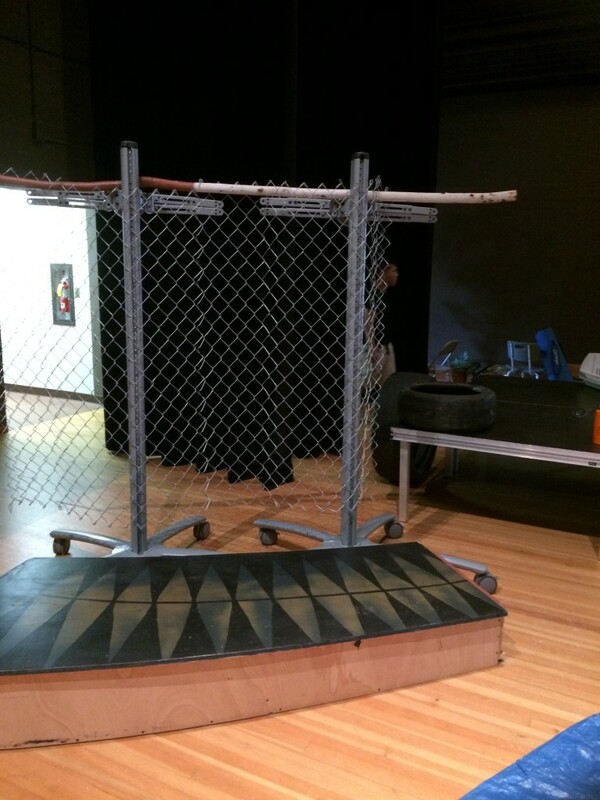 After scrambling, looking through items stored at the theatre and some chain link fence pieces we’d borrowed from another theatre, we jury rigged the perfect solution: two television monitors, a long stick of wood, the fencing and a platform. For the backdrop, we’d gathered a bunch of tarps, drop cloths, and plastic sheeting, thinking we’d just hang it from one of the fly battens. 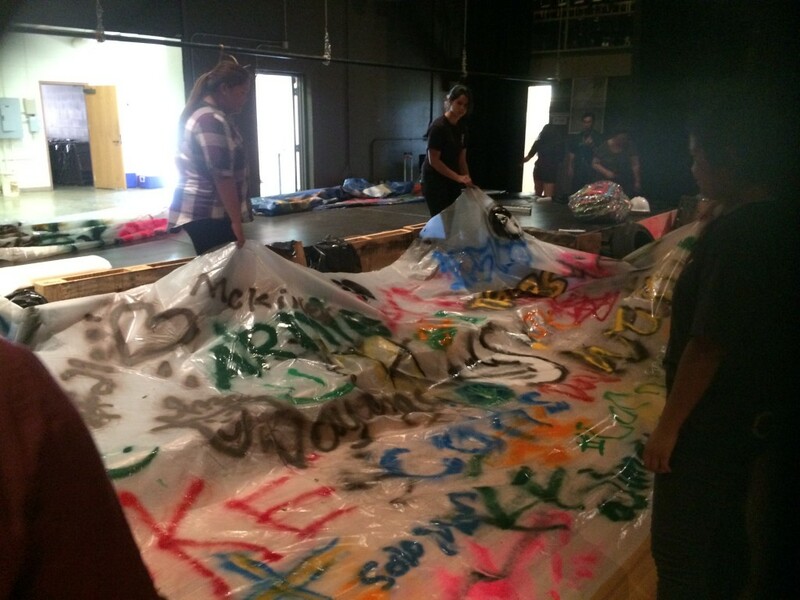 Karen had the brilliant idea of getting the cast members to cover the backdrop with graffiti. The final product was the perfect finishing touch. All the cast members added their own mark to the backdrop. Another hurdle, what to do about the stage lights? The light board in the theatre was installed in 1998. It still used plastic floppy discs! But another friend, Thomas Tochiki, came along and donated his time. Not only did he figure out how to use the board, but he took an inventory of the lights, refocused them, added colored gels, and gave the show a professional look. So, if you live in Honolulu and want to see a true work of art, and a work of “heart,” come on down. There are two performances left, Friday and Saturday, March 27 and 28 at McKinley High School’s M.M. Scott Auditorium. Tickets are $10.00 for adults and $5.00 for students. You can buy your tickets at the door or at Showtix4u.com. Thanks so much for stopping by, I love to hearing from you, so please feel free to leave a comment.